Woolly Weekend at Shepherd’s Cross returns Thursday, April 25 – Saturday, April 27. 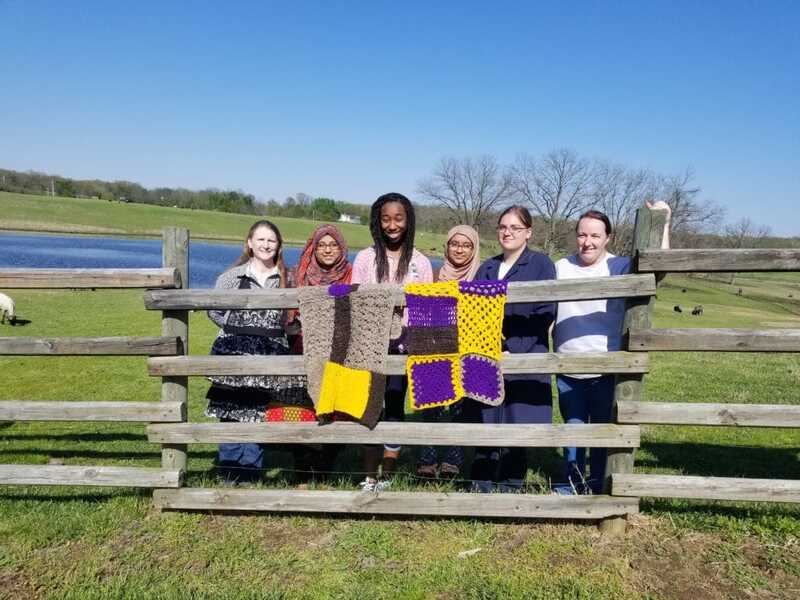 The festival will run from 10:00 am – 7:00 p.m.
Woolly Weekend is a “sheep to shawl” festival held at Shepherd’s Cross, an authentic working sheep farm, just north of Claremore on Scenic Route 66. Come to the farm and watch as the sheep are shorn (given a haircut). Sheep shearing occurs throughout the day. Over 250 sheep will be shorn on the farm this year. Watch the wool processed on site – combed, spun, woven, knitted, crocheted and felted into finished products. Children’s activities include weaving, games, wool project, and coloring contest. Visit the Farm Animal Barn & pet the barnyard animals, including baby lambs. Tour the educational interactive Farm Museum & Four Story Observation Silo. Sheep to Shawl: Over the three day event, at least three shawls will be created entirely from the first shorn wool on the first morning of the event. It is rare to find a true Sheep to Shawl event. Short Course Fiber Classes – learn drop spindling or needle felting both days. See website or call for information. Tour the Bible Garden – guided or self-guided tours throughout the day. Shepherd’s Cross features farm fresh, Animal Welfare Approved, pasture raised, free range, chemical free American lamb meat and Dexter beef. Samples will be available. USDA processed meat is available at the farm for purchase year round. The only AWA sheep farm in OK.
Yarn, yarn, & more yarn – natural, chemical free, many types, produced and processed on the farm. Shepherd’s Cross also offers roving, batts, felting supplies, knitting needles, spinning and weaving supplies and much more. AWA approved wool. Fiber Arts, Animal Husbandry & Shearing lessons available at the farm throughout the year. Shepherd’s Cross is home to a non-profit Christian organization named Heart of the Shepherd that hosts the event. Teaching basic agricultural principles and their relationship to the Bible are instrumental in the educational component of the farm. Join our Sheep to Shawl Team. Anyone who works with fiber is welcome. Inquire for additional information.This is a free event. Donations are welcome – suggested donation of $5 per person. Groups of 20 or more, please pre-register. Picnic area is available; bring your picnic lunch with you; limited seating. Snack and beverage concessions are available at Shepherd’s Shop. Woolly Weekend proceeds even in the case of inclement weather. Demonstrations will take place in the Amish built gambrel roof tour barn, which houses some of the animals as well as the wool processing, farm museum, and the gift shop. Shepherd’s Cross is an accredited Agritourism facility, a Made in Oklahoma Company, and is Animal Welfare Approved through “A Greener World”.